Welcome to SAGE Dining. TMI Episcopal and SAGE Dining Services are pleased to be offering your student a community inclusive dining program. 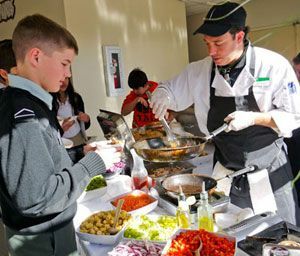 SAGE Dining Services has been serving independent schools since 1990. 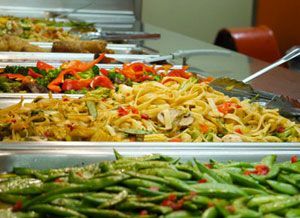 Their chefs take a healthy approach to preparing the food they serve. An in-house chef will prepares entrees, soup, salads and sandwiches daily. SAGE offers a daily salad bar with crisp greens, fresh vegetables, homemade specialty salads and healthy dressings. On the Classic Cuts Deli® bar, students can create their own sandwich. An assortment of fresh breads, high quality lean lunch meats, deli salads, and the finest cheeses are presented. Fresh toppings and condiments are offered for students to complete their creation. Fresh fruits and home baked desserts complete the lunch. Milk, juice, and a large selection of other beverages will be served. TMI and SAGE offers a full menu of breakfast favorites every day. A healthy breakfast in the morning helps students excel academically. They’ll feel better, be more attentive and more likely to engage in physical activities. It’s a great way to wake up their bodies and minds. SAGE provides a full dinner for Residential Life students. Dinner is covered as part of the cost of tuition for all Residential Life students, faculty and staff who live on campus (and their families), and for faculty and staff members who are helping Residential Life Students during study hall or attending a MacArthur Dinner (contact the Director of Residential Life if you plan to attend a MacArthur Dinner). If your TMI group that doesn’t regularly eat dinner in the Refectory will be needing dinner on a certain date, you may contact Maria Jimenez, Director of Food Services — SAGE Dining, at 210-564-6109 or sage@tmi-sa.org to plan accordingly. SAGE promotes healthy eating and nutrition education and color codes our menu offerings to highlight the healthy food choices at every meal. 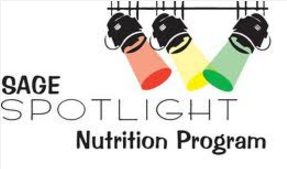 This program encourages students to select lower-fat items, as well as fresh fruits and vegetables. Our goal is to provide healthy, delicious meals that minimize the use of processed foods and avoid trans fats. STOP ...means these foods should be eaten in moderation. They do not have many healthy nutrients. Try to eat red dot foods only a couple of times a week. SLOW ...means these foods have important vitamins and minerals. Most of the foods you choose are probably labeled yellow. GO ...means the food is very healthy for you. These foods are full of vitamins and minerals that you need to be healthy and strong. Choose these foods as snacks, and to add color to your meal.